MIAMI (March 6, 2018) ─ Black Salmon – a national commercial real estate investment platform, and new business line of TSG Group, a boutique, diversified real estate development and investment company in South Florida – announced today the $70 million acquisition of Bank of Montreal (BMO) Plaza, through the purchase of entity 135 N. Pennsylvania, LLC. The 444,644-square-foot, ‘Class A’ office building is one of the most prominent towers in downtown Indianapolis’ central business district. 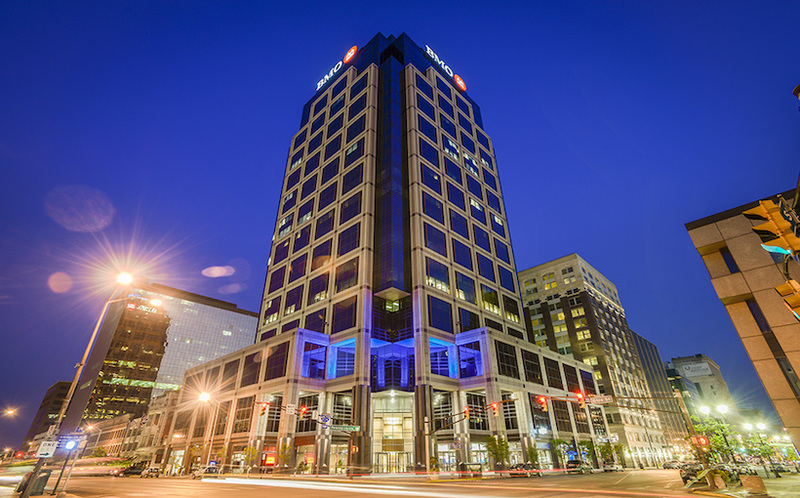 Located between Monument Circle and Mass Avenue, at 135 North Pennsylvania Street, the trophy property is occupied by notable finance, government and corporate tenants, such as BMO Harris Bank, the U.S. Department of Defense and General Electric Capital Services. This transaction furthers Black Salmon’s bullish strategy to increase investment in prime commercial real estate properties throughout the U.S. Recent acquisitions include the purchase of The Offices at Public Market – a ‘Class A’ building totaling more than 109,000 square feet in San Francisco – for $33 million. BMO Plaza meets nearly all the investment selection criteria implemented by Black Salmon, which includes low vacancy; proximity to top-tier universities, like Purdue University, Butler University, and Indiana University; as well as a sizable millennial population, among others. Indianapolis, named to Amazon’s HQ2 shortlist, is a thriving metropolis and burgeoning tech city, with the fourth highest tech-related job growth rate, according to CBRE’s Tech Industry report. Its diverse economy boasts a motivated workforce and a recent boom in tourism. Black Salmon is purchasing BMO Plaza with partner REDICO, a national real estate development and investment firm. REDICO is a privately-held, 50-year-old company with more than 18.2 million square feet of office, retail and multifamily under ownership and management, ranking them one of the top real estate firms in the country. In addition to a $6 million renovation in 2016 and 2017, Black Salmon plans to invest in further upgrades of BMO Plaza’s common areas. Black Salmon focuses on transforming its commercial real estate portfolio into profitable, risk-adjusted returns for a select group of investors. The platform offers a unique approach that includes a partnership with Euroclear, one of the world’s largest providers of post-trade services, covering more than one million securities. Black Salmon is helmed by firm managing partners Camilo Lopez and Jorge Escobar – Co-Managing Partners of TSG Group; Ignacio Murman – former head of acquisitions of Independencia Asset Management; Diego Madotta – former commercial vice president of Capital Markets Argentina; and Eduardo Escayol – a senior partner of Capital Markets Argentina. The group possesses a combined 40 years of real estate and financial investment experience, with a track record of more than $1.9 billion in purchased assets. Black Salmon is a national asset management company that specializes in the acquisition and management of corporate buildings in core U.S. markets. The firm connects foreign institutional and private individuals with world-class commercial real estate investments, all of which are managed with the highest standards of transparency and professionalism. Focusing solely on one asset class – commercial real estate – the Black Salmon team aims to transform corporate assets into profitable, risk-adjusted returns for a select group of international investors. Black Salmon is a business line of South Florida-based TSG Group. For more information, visit www.blacksalmon.com and www.tsg-group.com.